I purchased your material and in just hours I felt back on my feet again! 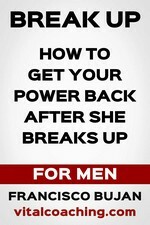 I purchased ‘How to get your power back after she breaks up with you’ and I want to thank you for your valuable coaching and advice. My ex broke up with me a year and a half ago and I went down the downward spiral. The break up was so sudden and devastating that I didn’t know how to recover from it. I had never had to walk through something as painful. And believe it or not, after a year and a half I was still waiting by the phone! It was really pathetic. I allowed myself to become a wreck. I finally came to my senses and realized that I needed to get some help for my situation. I purchased your material and in just hours I felt back on my feet again! I didn’t realize that I could reclaim my power and territory back, nor did I have any idea how to start. Your coaching has set off a chain reaction in my situation that will continue to allow me to grow and be energized! Now that I look back on it, it all seems a bit silly. I didn’t realize all the pitfalls I was falling into and all the mistakes I was making to take myself lower and lower. Pretty much all the ‘don’t do this’ advice you give, well, I did it at one point. But now I laugh because you have given me the strategy I needed to overcome and feel like a man again. I am truly thankful for you sharing this advice and coaching."